This entry was posted in Boeing, Embraer and tagged Boeing, Embraer on February 26, 2019 by Bruce Drum. This entry was posted in Boeing, Embraer and tagged Boeing, Embraer on January 11, 2019 by Bruce Drum. On July 13, 2018 an Embraer E190-E2 aircraft landed for the first time at London City Airport (LCY). 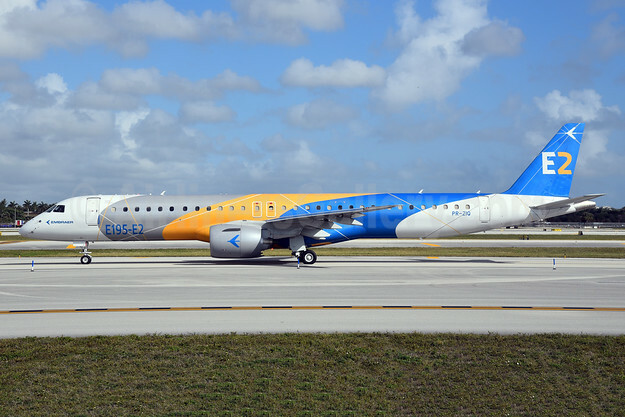 The newest aircraft from Embraer, the world’s quietest and most efficient in its class, entered into service in April this year. An aircraft from Embraer’s test fleet stopped off at LCY on its way to appear at next week’s Farnborough Air Show. The visit demonstrates the importance Embraer places on being able to offer LCY capability to airlines and its intention to work with London City Airport to certify the E2 to meet customer demand, which is likely to rise as LCY increases connectivity. In certification testing EASA figures confirmed the E190-E2 has the lowest noise levels among all new generation single aisle aircraft. If this performance can be replicated in the operational environment of London City Airport, the E190-E2 would meet the minimum noise restrictions of the airport’s new Aircraft Noise Categorisation Scheme (ANCS), which will be fully introduced next year. The E190-E2 is the first of a new generation of crossover narrowbody jets from Embraer. The aircraft entered into service with Norwegian carrier Widerøe in April. The E195-E2 goes into service next year with Azul in Brazil. The E190-E2 cuts fuel burn by more than 17%, and is the quietest passenger jet in the world today both in the cabin and outside. This entry was posted in Embraer and tagged Embraer on July 15, 2018 by Bruce Drum. In a ceremony held on February 28, 2018 at the Company’s facilities in São José dos Campos, Embraer received Type Certificate for the E190-E2, the first member of the E-Jets E2 family of commercial aircraft, from the Brazilian Civil Aviation Agency (Agência Nacional de Aviação Civil – ANAC), the FAA (Federal Aviation Administration) and EASA (European Aviation Safety Agency). It is the first time that an aircraft program with the level of complexity of the E2 receives a type certificate from three major worldwide certification authorities simultaneously. 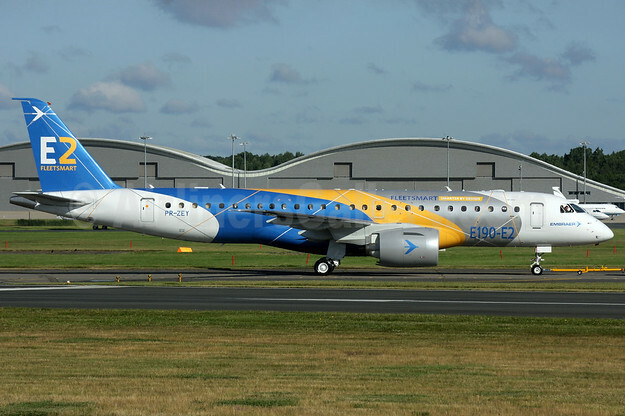 Top Copyright Photo: Embraer ERJ 190-300STD (E190-E2) PR-ZEY (msn 20001) (E2 FleetSmart) FAB (Antony J. Best). Image: 933758. This entry was posted in Embraer and tagged Embraer ERJ 190-300STD (E190-E2), msn 20001, PR-ZEY on February 28, 2018 by Bruce Drum.